The object of the game is to clear the playing area of tiles by matching pairs of tiles. In this online version, if no moves are made for at least 15 seconds, the game prompts which tiles can be swapped: 2 tiles blink for 2 seconds. The prompt does not necessarily indicate the optimal move but just a possible move. A player can only remove the tiles one pair at a time. 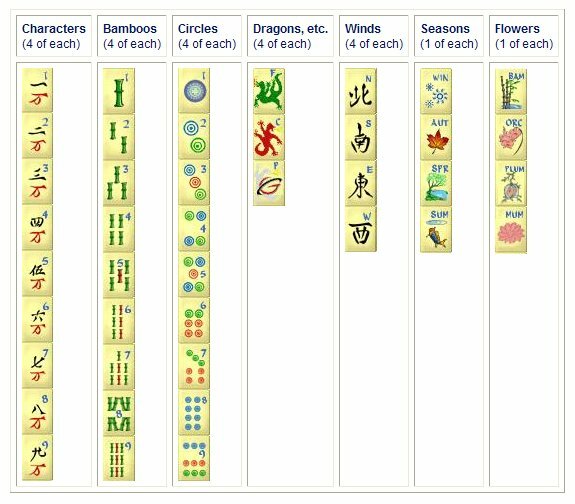 There are a total of 72 pairs in a game of MahJong Solitaire. Like cards, the tiles have standard suits. 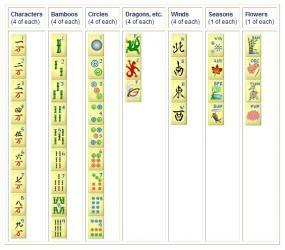 These suits are Characters, Bamboos, Circles, Dragons, Winds, Seasons, and Flowers. Although each tile layout requires a unique approach, the general strategy is to keep removing matching tiles in such a way that each removal would open up more possibilities for future tile matching.